Insulation and ventilation work in tandem to keep your home comfortable. Adequate ventilation creates a positive flow of air that allows the house to "breathe" and helps prevent moisture from damaging your attic and walls year-round. 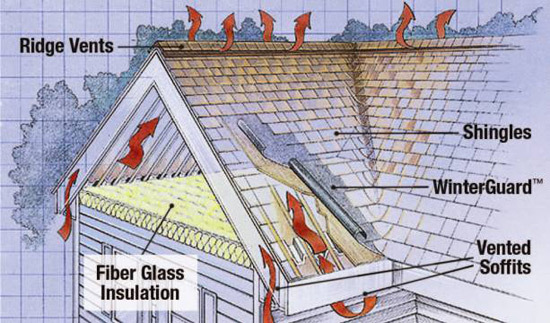 Improper ventilation can shorten the life of roofing shingles. Because warm air rises, vents are placed in the soffits or low on the rooftop to let in fresh air, and along the ridge of the roof or in the gables to let the warm air escape. Always provide at least two vent openings for proper air flow. Ventilation is especially needed in unused attics where insulation has been added to keep heat from leaking out of the rooms below in winter. Natural or static ventilation systems consist of simple vent or covered openings in your attic. Many experts agree that externally baffled ridge vents combined with vented soffits are the most effective method for ventilating an attic. Many codes require a ventilation area equal to at least one three-hundredth of the attic floor area. Ideally, 50 percent of the required ventilating area should be provided by vents located in the upper portion of your attic, while the remaining 50 percent should be provided by eave vents. Baffles at the soffits are necessary to protect insulation from air flow due to wind. Air movement through the material will reduce the effective thermal resistance. Contact us for a free roofing estimate today at (229) 432-0317.